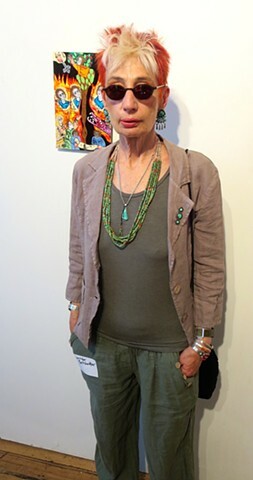 here i am at the opening night of my new york art show. neal and i took the bus up on thursday, went to the opening and stayed overnight. some friends came to see the show. the gallery was packed with people. it is always great fun to have a show in new york!!!! afterward we went to dinner at the red cat and had a fabulous meal, including the aperol spritz we started drinking in itlay on our just returned from month trip. we walked the streets on new york before the show. and felt right at home (since it is our home town). what an exciting vibrant city. the painting exhibited is "dialogues of the dead-11th dialogue". . . Hey Jennifer . . Cheers ! . . Hey NY . . enjoy ! Hola te mando un saludo y seguramente fue todo un éxito la exposición, muchas felicitaciones por tu trabajo. congratulations Jennifer. so happy for you and your career. :))))))) Congrats , jennifer ,,, !! I am thrilled only read that .Wish you will have a huge success , you deserve that . :))))))and have a good weekend ! Magnífica. Parabéns pela exposição. Abraço.